We added a free ebook "Skyrocket Your Ballet Skills" that include a few tips and exercises. We also added a life-time guarantee . Any Dancer Will Be Delighted To Receive This dance turning board As A Gift! Skyrocket your turns & your spins! Improve your spotting! & pirouettes! Boost your confidence! & Find your center balance! Ballet turn board curvature is engineered for minimum floor friction and maximum spin. We Believe In High Quality And Low Price! So Stop Thinking And Start Turning! ⭐ BALLET TURNING BOARD WILL SKYROCKET YOUR TURN SKILLS! Turns is very demanding for dancers as it requires excellent technique and a combination of skills. This top nontch dance turning board is engineered help you improve your turns by reducing friction and helping you spin faster. Get ready to see better and increased turns in record time! 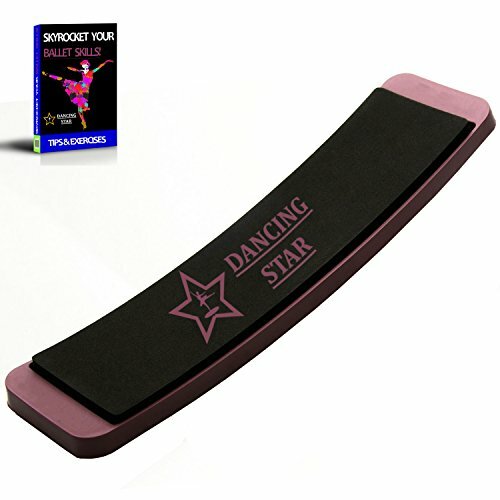 ⭐ PERFECT GIFT FOR ALL DANCE GENRES turn boards are a must have practice accessory for every dancer. Perfect for you or as a gift for your family/friends who dance ballet, hip hop, modern or street style gymnasts, ice skater and cheerleaders, this ballet turn board will help you improve your technique, acquire a strong core and excellent control of your body's movement. ⭐ IMPROVE YOUR DANCE TECHNIQUE, balance & spotting. Apart from gaining confidence and building a solid turning technique, turning board will assist in understanding your body's center, focused spotting and correct arm placement during pirouettes, turns, and spins. ⭐ EXTREMELY DURABLE, PORTABLE AND LIGHTWEIGHT - Don't waste your money on other breakable cheap turning boards turn star board is made high-quality PLASTIC that makes the board super durable yet lightweight. The board upper side covered with a soft, non-slip top rubber foot pad for long-lasting training support. The board Does not scratch wooden floors. ⭐ BONUS E-BOOK AND 60 DAY MONEY BACK GUARANTEE! - turn star mission is to be the number #1 among our competitors. That's why we added a FREE E-book "Skyrocket Your Ballet Skills" this E-book include tips & exercises that will help you improve your ballet skills and get better results at your training. We also added our turning board a premium 60-day full refund guarantee! If you are not 100% satisfied. If you have any questions about this product by Star Creations, contact us by completing and submitting the form below. If you are looking for a specif part number, please include it with your message.